especially for you who do not like Autocrad and its clones. RealCADD is available in English, German and French for Windows, Mac OS X and Linux. Its files are fully compatible with iPocket Draw, our program for iPhone and iPad. mainly at the request of its users via our discussion forum. Developed on Macintosh respecting the recommendations of Apple, including WYSIWYG. 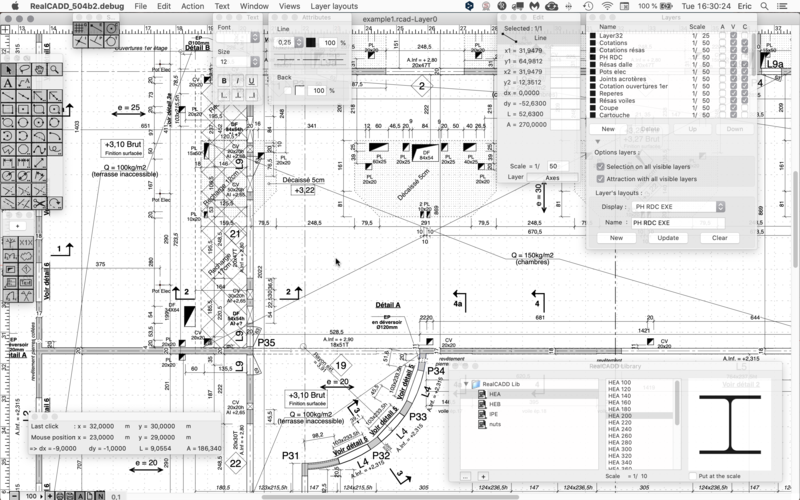 Again, this is not a clone of AutoCAD ported quickly on Mac from Windows. So you draw with a selected scale (as in hand) like you want to have on your printed drawing, there is no paper space or object space but a simple configurable drawing surface and printing is not complicated even if your drawing consists of several A4 pages eg. The user interface is implemented with floating windows that unfold depending on the context. closed: opened: This pallet unfolds as soon as it is flown by the mouse cursor. This pallet allows you a great choice of drawing tools: text, text with line, line, constrained line, rectangle, rectangle rounded, ellipse, arc, polygon, regular polygon, free line, spline, line of quotations simple or multiple, quotation of angles. 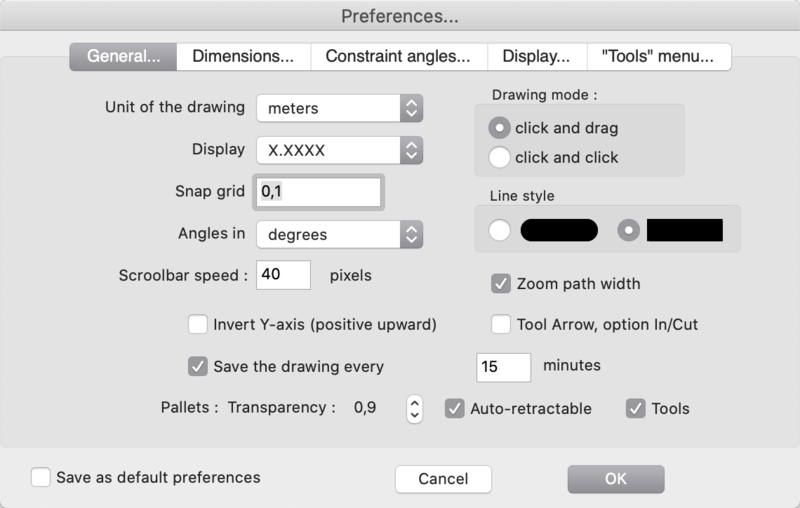 All the tools are used in an intuitive way, and you can choose between two drawing mode : click and drag or click and click (choose in the preferences). The drawing of objects can be constrained while pressing on the Shift key thus an oval will be perfectly round and a rectangle will be square. You can also use the parameter setting of the Parallel tool to trace parallel objects directly, for that it is enough to begin the drawing of the object while pressing on the Alt key (Ctrl + Alt on Linux) and, while finishing with the Ctrl key, you erase the object guides. In addition to the drawing tools, you have tools of construction: Extend & Cut, Chamfer, Fillet, Parallels, Cutting tool, Rotation tool. And also a zoom, a lasso for selection and a hand to move the drawing or the page of printing. 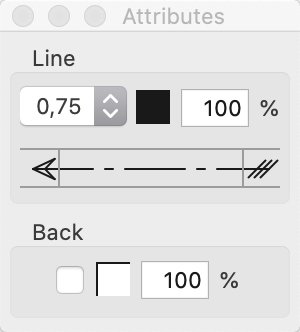 For all tools with parameters (tools with 2 points in bottom on the right of their icon), one click on the tool with the key Option or Alt down or a double click, will display the parameter's dialog for the tool. RealCADD has a mode of help for all the windows, pallets etc, by displaying a small windows, shown opposite, for the Arrow tool in which one discovers hints for using the tool and the keyboard shortcut if available, such as “Esc” for the arrow tool. These windows are displayed when the cursor remains on an icon, a button, etc for a few moments without moving. - Dotted or plain single or double lines. It should be noted that RealCADD manages the dotted lines uninterrupted for the rectangles and the polygons and not simply of top at top like certain commercial programs. Of course, RealCADD has automatic "snap to" functions which can be turned on or off via this pallet. - Snap To grid. The grid being skeletal. - Snap To object ends. - Snap To object centers. 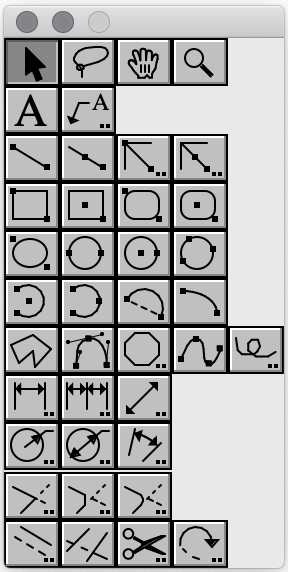 - Snap To object intersections. Snap To can be turned on or off by clicking on the pallet item or with a keyboard shortcut. Snap To can be modified during the course of drawing an object, you can thus begin the drawing from an object with certain active Snap tos and finish it with others. That is useful if your drawing is complex or if certain objects are small. The object edit pallet shows you the coordinates of the selected object, like its lengths and his possible angle and also its perimeter (P =) and its surface (S =). The display of this pallet varies according to the type of object for which the data is displayed. 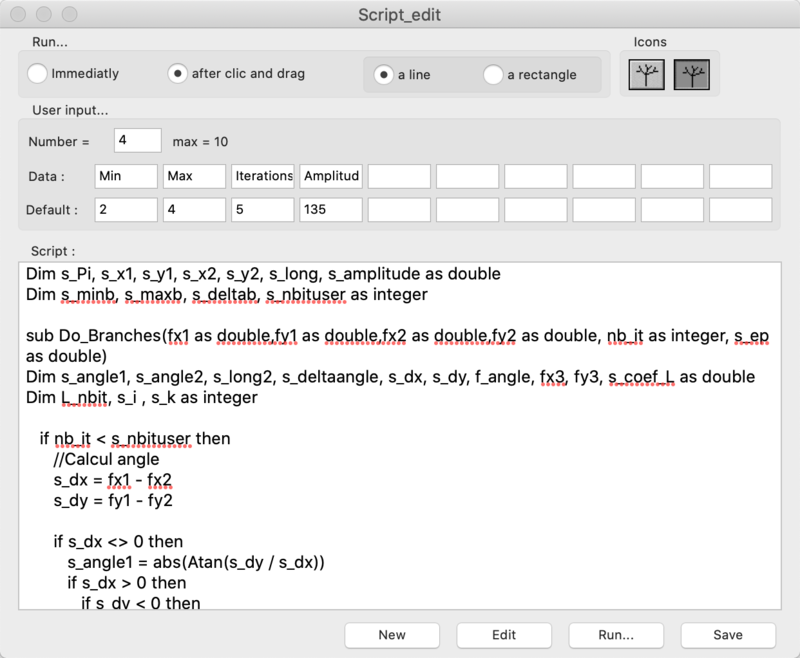 You can also modify objects by entering values or arithmetic formulas in the edit fields. Modifications will apply to all selected objects. This pallet also indicates the number of selected objects as well as their scale. If the layer of the selected object is not the active layer, you can use the button to make it active. 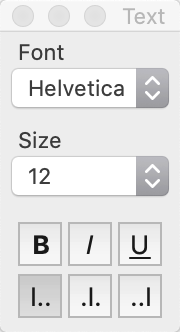 The Text pallet shows the same options as in the Text menu, choice of the font and size of text, choice of the style, bold (B), italic (I) and underline (U) and choice of the alignment, left, center, right. The access is faster than with the menu and the pallet lets you see all attributes of the last selected text or of the tool Text. RealCADD allows you to draw with layers when you are in "Worksheet" mode. Layers can be named, have default scale and color (C) and be hidden or visible (V), new objects are drawing on the active layer (A). You can add or remove layers. You can select objects either on the active layer only or on all visible layers. You can choose to allow all layers to let Snap To be used. The drawing of the objects is done according to the order of the layers. 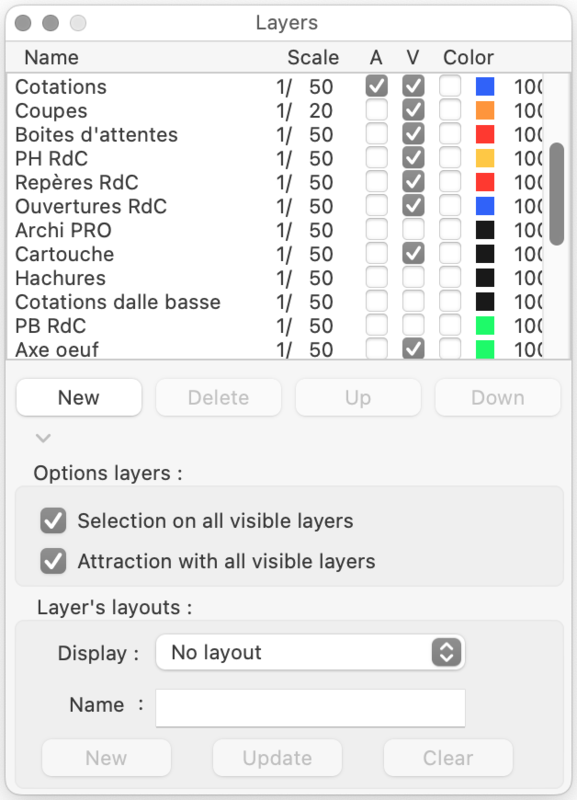 You can change this order into selecting a layer and clicking on the buttons "Up" or "Down" or by dragging a layer in the list. 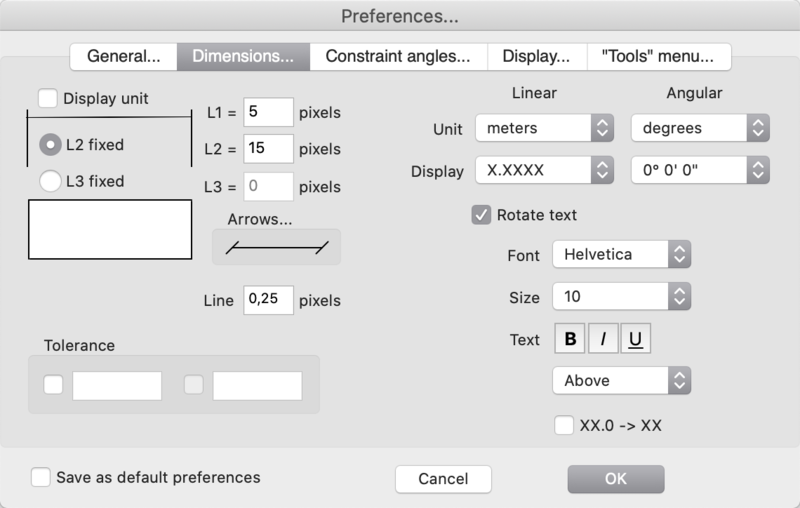 You can also define configurations of layers or "layer's layout's". That makes it possible to have several drawings using one file. Any layer can be used with several “Layer's layout’s” and a modification on one of these layers is visible on each “Layer's layout’s”. The same pallet is shown when a drawing is in mode "Workbook". Menu "File" -> "New" -> "Workbook". 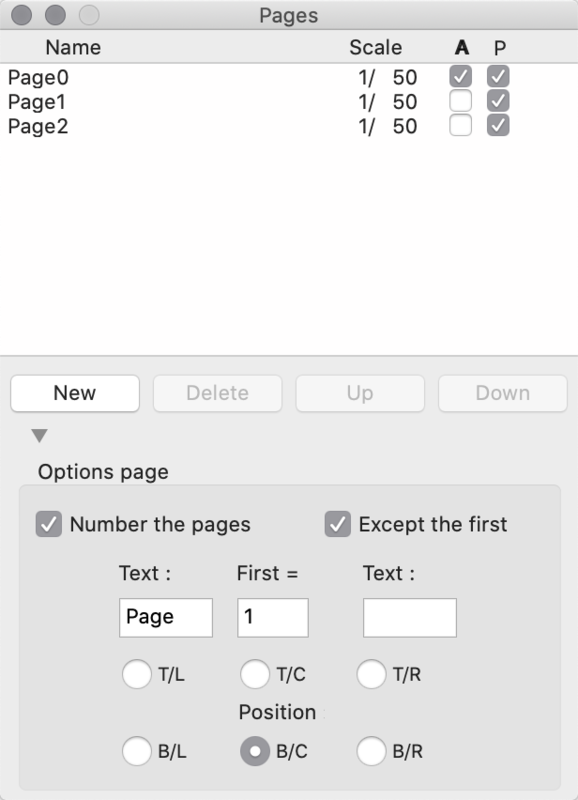 With the mode "Workbook", you can manage a drawing like manually filling a workbook with pages. All pages are of the same size, this one of the printing page. Only one page is visible and active, this will be the one with the check box "A" on. For the printout, you can number the pages with the "Options of pages" at the bottom of the pallet. The radio buttons allow you to choose the position of the number on the page. The printout is not standard in mode "Workbook". 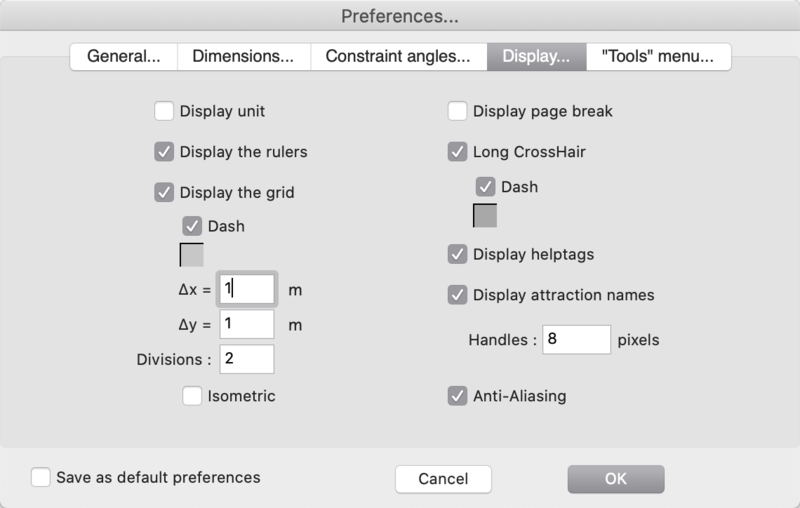 RealCADD doesn't use, in this case, the options of Pages, All or From - To, in the print dialog. But a partial printout is made more simply by using the check boxes "P". Only the pages with the check box "P" on will be printed. Of course, this doesn't change the number of the pages. In addition to all these basic functions, RealCADD allows you to create your own tools using a scripting language. But the simplest is that you test RealCADD. or this other and better manual made by an user. And do not hesitate to ask us during your test. Before payment and receipt of an unlock code, RealCADD runs in "demo" mode (without the ability to save). All other features are available. RealCADD costs only $ 75.